We're Proud Dealers of Trek and Electra Bicycles. Though these two brands make up the bulk of our inventory, and we think they are among the best companies in the industry, we also carry a number of other niche brands, with access to even more. Trek is our main brand and makes a mind boggling selection of the best bikes available. Trek gives you the most for your money, with an industry leading warranty, and the most "bang for buck" bikes around. Found the bike you like, but the color or components are not quite right? Relax. That's what Project One is here for. 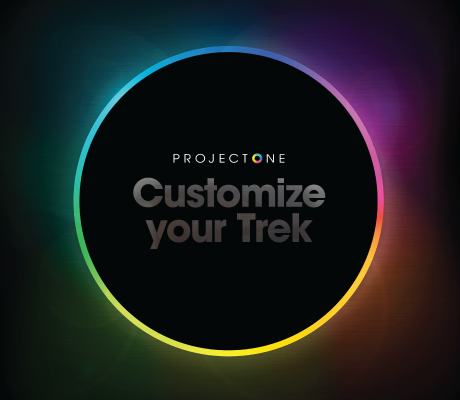 Design every detail of your dream ride, then let Trek bring your vision to life. Starting at an additional $500 with applicable models. Looking for the most relaxed, most stylish ride around? Check out Electra. Their Flat Foot technology, and myriad of paint schemes will make sure you'reconfident and comfortable, in all aspects of your bike ride. Surly makes durable bikes that border on indestructible. Their range of steel bikes may not be the lightest in town, but they are going to carry the most gear, into the remotest places. All-City makes very classy steel bikes, with focus on everyday use and urban environments. Their bikes look as good as they ride and have lots of nice classic details. Our used bike inventory fluctuates on a regular basis. The best way to find out about our used bikes is to stop by or give us a call. If we don't what you're looking for, let us know your needs and budget, and it might be possible to put something together for you. We have access countless parts and accessories brands. Below are some the brands we carry regularly and think exemplify our dedication to quality. From Helmets to Lights, Wheels to Seats and Handlebars, Bontrager does it all. As a Trek brand you can expect the best from Bontrager. Nobody makes better, or more, bicycle components than Shimano. Period. We carry Continental tires for both entry level and premium needs. Made in Germany, continental makes some of the best, and our favorite, tires you can buy. We are really excited about Knog lights. They make a wide variety of very versatile, feature packed rechargeable and battery powered lights that help you see and be seen. HED makes the best wheels in the world. Thinking about a new set of road bike wheels? The HED Belgium rim is the best rim made. Everything made by HED is awesome. With a lifetime warranty, Saris offers racks to fit any vehicle at reasonable prices. Saris really stands behind their products.